Is being awesome really as awesome as it sounds? 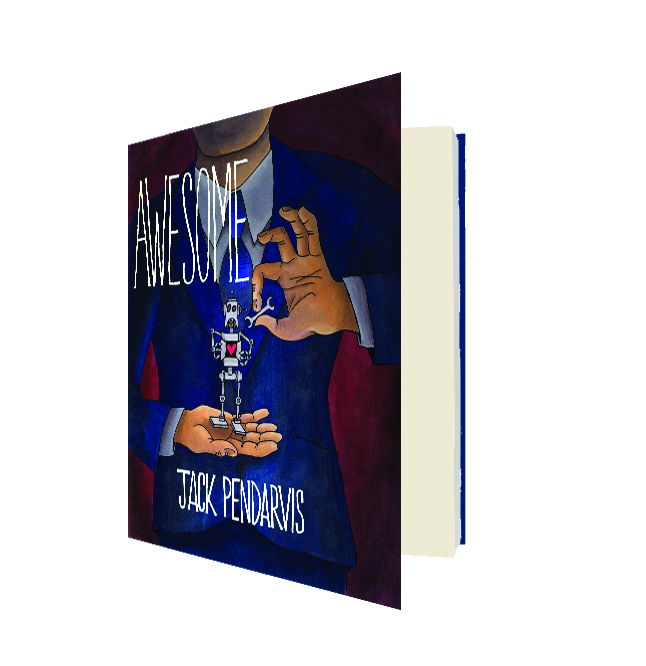 Jack Pendarvis’s first novel resembles one of those epics in which the mighty warrior undertakes a series of episodic challenges and overcomes a number of obstacles in order to woo back his beloved or to return home or whatever. Our hero with a thousand faces, in this case, is a giant named Awesome. Apart from his size and strength, Awesome likes to think of himself as just another average joe like you or me. “Deep down I am just a regular guy,” he reminds us. Despite the fact that he can lift automobiles, build robots, and compose oratorios, he humbly admits that he’s “at ease with the lingo of the common folk, explaining complex truths in a down-to-earth slang accessible to all.” Out of the generosity of his enormous heart, he has dedicated his life to doing good deeds and helping others—but not everyone fully appreciates his kindness. If Awesome has a tragic flaw, as so many epic heroes do, it’s his extreme horniness. “Ejaculatory release,” he warns us, “like sleeping and dining, falls under the rubric of necessity.” It’s a bit of an issue for his betrothed, Glorious Jones. His troubles begin in large part, as so many people’s do, on his wedding day. During the exchange of vows, it becomes apparent that Ms. Jones has made other plans. “She proceeded to defame me in the foulest language imaginable, concluding with the statement that she wouldn’t marry me if I were the last person on the bleeping earth.” Soon afterward, her attorney delivers a stack of envelopes, each of which contains the name of an item that he must find to win her hand. Thus the adventure begins. Glorious Jones’s list of demands includes a few mythic standbys, like “A Needle in a Haystack” and “A Four-Leaf Clover,” as well as some more mundane things like “A Maraca” and “The Meaning of Life.” While searching for these things, Awesome gets into all kinds of wacky high jinks, meets another giant, and grows steadily more fascinated by his own genitalia. “All the philosophizing about principles and footling around in the world won’t find you the meaning of life. I made the necessary preparations to take a good, hard, long, tender, contemplative gander at my own astonishing crotch.” He soon gelds himself, just to make a point. Like that of the Enamoured Knight, as Douglas Glover calls Don Quixote, Awesome’s tale displays a winking knowledge of the literary traditions in which it participates. At one point, the giant recognizes the symptoms of amnesia from “a number of bestselling experimental literary novels concerned with the human condition and the limitations of language itself.” When he decides to build a time machine, Awesome looks to Flann O’Brien and H. G. Wells, Mark Twain and the TV show Quantum Leap for inspiration. Pendarvis’s talents shine the brightest during those moments when the literary and the popular collide. The epigraph, mind you, comes not from Louis-Ferdinand Céline but from Céline Dion. Critics smarter than I am may try to tell you the character of Awesome symbolizes something—maybe the precocity of America in these late-­imperial days, maybe literature itself in this age of digital reproduction—but feel free to ignore them. Despite the absurd subject, Awesome isn’t trying to be laugh-out-loud funny. You can think of this strange and wondrous novel as a combination of Shrek and Don Quixote, with a little bit of Caligula tossed in for good measure.